will always be ours and can never be silenced! 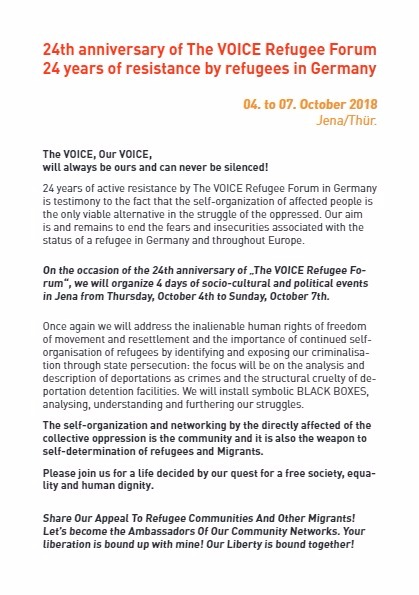 24 years of active resistance by The VOICE Refugee Forum in Germany is testimony to the fact that the self-organization of affected people is the only viable alternative in the struggle of the oppressed. Our aim is and remains to end the fears and insecurities associated with the status of a refugee in Germany and throughout Europe. On the occasion of the 24th anniversary of „The VOICE Refugee Forum“, we will organize 4 days of socio-cultural and political events in Jena from Thursday, October 4th to Sunday, October 7th. 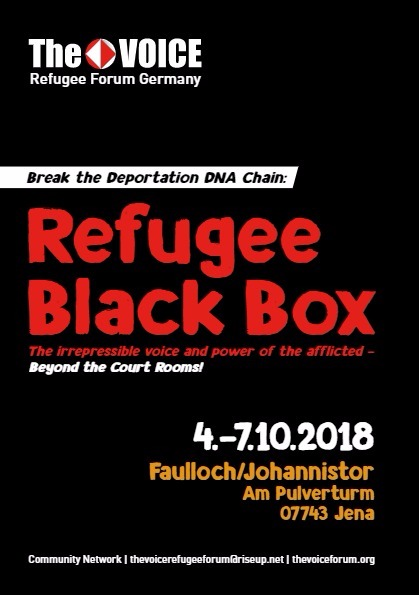 Once again we will address the inalienable human rights of freedom of movement and resettlement and the importance of continued self-organisation of refugees by identifying and exposing our criminalisation through state persecution: the focus will be on the analysis and description of deportations as crimes and the structural cruelty of deportation detention facilities. We will install symbolic BLACK BOXES, analysing, understanding and furthering our struggles. The self-organization and networking by the directly affected of the collective oppression is the community and it is also the weapon to self-determination of refugees and Migrants. Share Our Appeal To Refugee Communities And Other Migrants! Let’s become the Ambassadors Of Our Community Networks. Your liberation is bound up with mine! Our Liberty is bound together! We call on you to endorse and symbolize the Stop deportation struggle with the refugee Black Box. We want to revive the political tools of our struggles on related topics „disrupt the persecution and eu authoritarianism“ against refugees and migrants. The struggles of refugee resistance and justice is by our continuity in Germany. Support the refugee political movement. We are calling on refugees/Asylum Seekers and Migrants to build trustworthy Communities to strengthen our solidarity against the continuous inhumane treatments in Germany and Europe. Self-organization goes beyond telling our stories and our problems to the others. Its objective should be empowering through an independent political platform and self-determination in the refugee/Migrant community with refugee/Migrant activists and for the refugees/Migrants. Contact us for further information on how to join and become active in our Communities and the NETWORK. 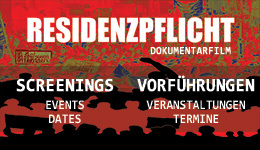 You can also inform us about your demands for justice and struggles against refugee repressions and injustice in your localities in the regions of Germany. We are inviting Refugees and Migrants to compliment this call by sending us your appeals from your communities in solidarity for networking.